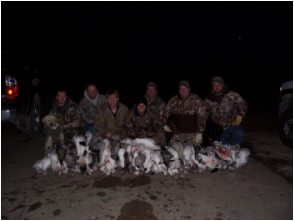 With over 40 years of tradition and experience, Kopecky Hunting Club offers prime northeastern Nebraska waterfowl hunting opportunities for the true enthusiast. We are located one mile west of the Missouri River, ten minutes north of Tekamah, Nebraska and an hour north of Omaha, Nebraska. The waterfowl habitat is managed by entering land into wetland easements and flooding fields. Hunting opportunities are offered out of heated pit blinds accompanied with guides. Kopecky Hunting Club has memberships available for the 2011/12 waterfowl season. If you are looking for a place to hunt we would love to hear from you! For more information about membership Click Here.